DELAWARE, Ohio – Nancy A. Youssef, national security correspondent for The Wall Street Journal, will discuss “U.S. National Security and the Trump Administration” when she presents Ohio Wesleyan University’s 16th Annual Corinne Lyman Lecture on International Studies. The award-winning journalist will speak at 7 p.m. Sept. 25 in Room 312 of OWU’s R.W. Corns Building, 78 S. Sandusky St., Delaware. Her presentation is free and open to the public. Before joining The Wall Street Journal, Youssef served as the senior national security correspondent for Buzzfeed News and senior national security correspondent for The Daily Beast. Prior to that, she worked for McClatchy Newspapers, where she served in roles including national security correspondent, Middle East bureau chief in Cairo, and chief Pentagon correspondent in the United States. 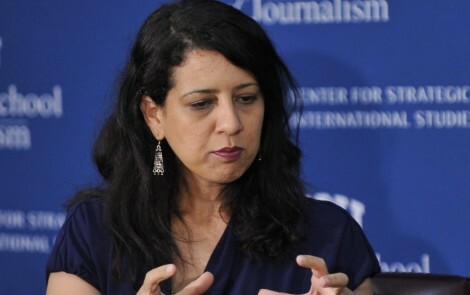 Founder of the Pentagon Press Association, Youssef has won several awards for her work, including the University of Virginia’s Lawrence Hall Award for Distinguished Journalism covering the Middle East, as well as awards from the Maryland-D.C. Delaware Press Association and the Detroit chapter of the Society of Professional Journalists. A native of Washington, D.C., Youssef earned her bachelor’s degree in economics from University of Virginia and her master’s degree in security studies from Georgetown University’s School of Foreign Service.